After our previous post on computing image colorfulness was published, Stephan, a PyImageSearch reader, left a comment on the tutorial asking if there was a method to compute the colorfulness of specific regions of an image (rather than the entire image). There are multiple ways of attacking this problem. The first could be to apply a sliding window to loop over the image and compute the colorfulness score for each ROI. An image pyramid could even be applied if the colorfulness of a specific region needed to be computed at multiple scales. However, a better approach would be to use superpixels. Superpixels are extracted via a segmentation algorithm that groups pixels into (non-rectangular) regions based on their local color/texture. In the case of the popular SLIC superpixel algorithm, image regions are grouped based on a local version of k-means clustering algorithm in the L*a*b* color space. Applying superpixel segmentation to the input image. Looping over each of the superpixels individually and computing their respective colorfulness scores. 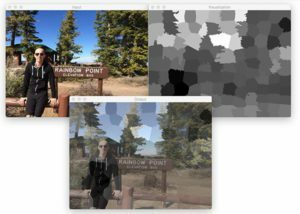 Maintaining a mask that contains the colorfulness score for each superpixel. Based on this mask we can then visualize the most colorful regions of the image. Regions of the image that are more colorful will have larger colorful metric scores, while regions that are less colorful will smaller values. To learn more about superpixels and computing image colorfulness, just keep reading. In the first part of this blog post we will learn how to apply the SLIC algorithm to extract superpixels from our input image. The original 2010 publication by Achanta et al., SLIC Superpixels, goes into the details of the methodology and technique. We also briefly covered SLIC superpixels in this blog post for readers who want a more concise overview of the algorithm. Given these superpixels, we’ll loop over them individually and compute their colorfulness score, taking care to compute the colorfulness metric for the specific region and not the entire image (as we did in our previous post). After we implement our script, we’ll apply our combination of superpixel + image colorfulness to a set of input images. The first Lines 1-8 handle our imports — as you can see we make heavy use of several scikit-image functions in this tutorial. The slic function will be used to compute superpixels (scikit-image documentation). Lines 10-31 represent our colorfulness metric function, which has been adapted to compute the colorfulness for a specific region of an image. The region can be any shape as we take advantage of NumPy masked arrays — only pixels part of the mask will be included in the computation. Splits the image into RGB component channels (Line 14). Masks the image using mask (for each channel) so that the colorfulness is only performed on the area specified — in this case the region will be our superpixel (Lines 15-17). Uses the R and G components to compute rg (Line 20). Uses the RGB components to compute yb (Lines 23). Computes the mean and standard deviation of rg and yb whilst combining them (Lines 27 and 28). Does the final calculation of the metric and returns (Line 31) it to the calling function. --image : The path to our input image. --segments : The number of superpixels. The SLIC Superpixels paper shows examples of breaking an image up into different numbers of superpixels. This parameter is fun to experiment with (as it controls the level of granularity of your resulting superpixels); however we’ll be working with a default=100 . The smaller the value, the fewer and larger the superpixels, allowing the algorithm running faster. The larger the number of segments, the more fine-grained the segmentation, but SLIC will take longer to run (due to more clusters needing to be computed). On Line 43 we load our command line argument --image into memory as orig (OpenCV format). We follow this step by allocating memory with the same shape (width and height) as the original input image for our visualization image, vis . Next, we load the command line argument --image into memory as image , this time in scikit-image format. The reason we use scikit-image’s io.imread here is because OpenCV loads images in BGR order rather than RGB format (which scikit-image does). The slic function will convert our input image to the L*a*b* color space during the superpixel generation process assuming our image is in RGB format. Load the image with OpenCV, clone it, and then swap the ordering of the channels. Simply load a copy of the original image using scikit-image. Either approach is valid and will result in the same output. Superpixels are calculated by a call to slic where we specify image , n_segments , and the slic_zero switch. Specifying slic_zero=True indicates that we want to use the zero parameter version of SLIC, an extension to the original algorithm that does not require us to manually tune parameters to the algorithm. We refer to the superpixels as segments for the rest of the script. We start by looping over each of the individual segments on Line 52. Lines 56 and 57 are responsible for constructing a mask for the current superpixel. The mask will have the same width and height as our input image and will be filled (initially) with an array of ones (Line 56). Keep in mind that when using NumPy masked arrays, that a given entry in an array is only included in a computation if the corresponding mask value is set to zero (implying that the pixel is unmasked). If the value in the mask is one, then the value is assumed to be masked and is hence ignored. Here we initially set all pixels to masked, then set only the pixels part of the current superpixel to unmasked (Line 57). Using our orig image and our mask as parameters to segment_colorfulness , we can compute C , which is the colorfulness of the superpixel (Line 61). Then, we update our visualization array, vis , with the value of C (Line 62). At this point, we have answered PyImageSearch reader, Stephan’s question — we have computed the colorfulness for different regions of an image. Since vis is currently a floating point array, it is necessary to re-scale it to a typical 8-bit unsigned integer [0-255] array. This is important so that we can display the output image to our screen with OpenCV. We accomplish this by using the rescale_intensity function (from skimage.exposure ) on Line 67. Now we’ll overlay the superpixel colorfulness visualization on top of the original image. We’ve already discussed transparent overlays and the cv2.addWeighted (and associated parameters), so please refer to this blog post for more details on how transparent overlays are constructed. orig : Our input image. vis : Our visualization image (i.e., level of colorfulness for each of the superpixel regions). output : Our output image. Figure 1: Computing a region-based colorfulness score using superpixel segmentation. On the left you can see the original input image, a photo of myself exploring Antelope Canyon, arguably the most beautiful slot canyon in the United States. Here we can see a mixture of colors due to the light filtering in from above. In the middle we have our computed visualization for each of the 100 superpixels. Dark regions in this visualization refer to less colorful regions while light regions indicate more colorful. Here we can see the least colorful regions are around the walls of the canyon, closest to the camera — this is where the least light is researching. The most colorful regions of the input image are found where the light is directly reaching inside the canyon, illuminating part of the wall like candlelight. Finally, on the right we have our original input image overlaid with the colorfulness visualization — this image allows us to more easily identify the most/least colorful regions of the image. Figure 2: Using superpixels, we can first segment our image, and then compute a colorfulness score for each region. Here we can see the least colorful regions of the image are towards the bottom where the shadow is obscuring much of the sidewalk. The more colorful regions can be found towards the sign and sky itself. Figure 3: Labeling individual superpixels in an image based on how “colorful” each region is. Notice here that my black hoodie and shorts are the least colorful regions of the image, while the sky and foliage towards the center of the photo are the most colorful. In today’s blog post we learned how to use the SLIC segmentation algorithm to compute superpixels for an input image. We then accessed each of the individual superpixels and applied our colorfulness metric. The colorfulness scores for each region were combined into a mask, revealing the most colorful and least colorful regions of the input image. By examining the raw vis mask. Creating a transparent overlay that laid vis on top of the original image. In practice, we could use this technique to threshold the mask and extract only the most/least colorful regions. To be notified when future tutorials are published here on PyImageSearch, be sure to enter your email address in the form below! This example could be made even simpler by using the regionprops functionality in skimage.measure. Masked arrays are not very fast, unfortunately, so I tend to avoid them. Thanks for the suggestion, Stefan! Part of the reason I used NumPy’s masked arrays was simply re-familiarize myself with them. But you are right, regionprops is also a good choice. I very enjoy your posts! Just one question: Do you know deep learning work using graphs? I think this is an interesting topic. Hi André — what do you mean by “deep learning work using graphs”? Are you trying to build a graph of superpixel-like structures using deep learning? Or are you trying to apply deep learning to actual graphs (i.e., figures and plots)? I build a similarity graph through superpixels and would like to apply in deep learning. Taking as input the graph. Do you know anything about this? What would the end goal be of supplying a machine learning model with the graph? What are you trying to accomplish? The segments variable is a NumPy array containing our superpixels. Each superpixel has a unique integer value. Therefore, we can find all (x, y)-coordinates in mask that have segments == v (implying that we are extracting all pixels part of the superpixel with value v). There is accomplished by NumPy array indexing. Another great blog post! – Thanks very much. Again, thanks for taking the time to show us how to do such thing. I implemented your code for the http://www.openframeworks.cc toolchain. Very cool, thanks for sharing Stephan. I am wondering if there is a better way to derive the mean color from each super pixel cluster. Currently is adding all R,G,B values together and dividing them by the amount in each array. I find this makes for a very muddy color. Since this code does evaluate the colourfulness, is there a way to get a color repesentation of this color? My eye catches the brighter more intense colors, but the mean does not give me this feeling. Hi Stephan — I’m not sure what you mean by a “color representation of this color”? Do you mean the name of a color? In your example you have one set where you show the source image with each super pixel cluster filled with a single color. This color seems to be the mean color of all pixels inside this cluster. I would like this color to be the most colourful one in the cluster, not the mean. Is there a way to extract that information? Hi Stephan — can you elaborate on “I would like this color to be the most colorful one in the cluster”? The most colorful pixel? if one of the pixel cluster has a lot of black or white in it, but also has nice yellow dot in the middle then it might still get a high colourfulness score. how do I now extract the information about this choice? if I average the pixels in that cluster than the black/white will muddy the resulting mean color. how can I query your code to know more about which of the colours present in this specific cluster allowed it to receive a high score? in the end I want to represent this cluster by it’s most “beautiful” / most noticeable colour, not the mean. The most “beautiful/noticeable” color seems a bit subjective here. The colorfulness score was developed to work on aggregate (i.e., means) and are correlated with the authors’ test subjects. You can’t really query a single pixel using this method. Hi, I have created the superpixel by using SLIC. I want to pass superpixels to the classifier. For this, I have to label the superpixel by manually. It will be great, if you suggest the way. I think it would be beneficial to learn what the end goal of the project is. Is there a particular reason you need to label the superpixel manually? This is potentially possible but you should instead use a pixel-wise segmentation algorithm. Segmentation embodies a large amount of literature but recent approaches use deep learning. Take a look at UNet and DeepMask.